Lawmakers are once again taking steps to ensure the Trump administration does not implement elements of its plan to reorganize the government without authority from Congress, putting a potential snag in the White House’s plans. Both the House and Senate included in their fiscal 2019 appropriations bills provisions to block unilateral efforts to reshape the Office of Personnel Management, General Services Administration and other agencies covered in the general government spending measure. The White House has proposed folding much of OPM into a restructured GSA and bringing much of what remains under its own umbrella. The bill specifically prohibits using any funds to create a new program, eliminate a program or activity, reduce a program or activity by the lesser of $5 million or 10 percent, or create or reorganize offices “unless prior approval is received from the Committee on Appropriations” in both the House and Senate, among other restrictions. The administration has vowed to work with Congress in implementing the 32 proposals outlined in its reorganization plan last month, but has said it could make certain changes on its own. During a House hearing last month, Office of Management and Budget Deputy Director Margaret Weichert suggested the White House could initiate its OPM reorganization unilaterally. In a Senate hearing last week, however, Weichert did not list OPM as an example of the 10-12 proposals she said the administration could enact without legislative assistance. Weichert declined to spell out all of those changes despite repeated requests from members of the Senate Homeland Security and Governmental Affairs Committee, saying the plans were still in a deliberative stage. OMB did not respond to a request for clarity on the agency’s thinking on its OPM reorganization authority. Despite the language in the spending bills, the administration is already preparing for the changes. An OPM spokesperson said on Monday there are discussions underway at the agency to determine how the changes might take effect, as first reported by Federal News Radio. 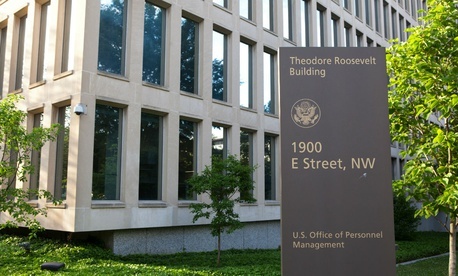 A spokesperson at GSA said the agency has created an internal task force to determine how to best absorb OPM's functions. Mary Davie, deputy commissioner at the Federal Acquisition Service, is leading that charge. The OPM proposal has been met with widespread criticism, ranging from lawmakers to former Trump officials that helped launch the reorganization effort. A Senate committee is holding a hearing on the potential changes this week. In other areas, lawmakers provided some leniency for the administration’s proposed reorganization while still looking to maintain oversight. The Senate spending bill setting funding for the Interior Department provided requested funds for the agency’s proposed reforms, but set restrictions on when they could be spent. As it did last year, the Senate measure would block the Environmental Protection Agency from engaging in “workforce reshaping” or closing any regional offices. The prohibition would extend to any reorganization, workforce restructuring or transfers of functions and apply to all laboratories. A provision of the House report accompanying the Energy Department’s fiscal 2019 spending bill requires the agency to receive approval from the House and Senate before it moves money around to pay for any reorganization. Senate appropriators included similar language in a spending measure for the departments of Labor, Health and Human Services, and Education. The House has approved its general government appropriations bill, while the Senate is expected to vote on it this week. Spending measures covering virtually all facets of government are expected to go to conference committees, which will approve their own final reorganization instructions, before heading to final votes and President Trump for his signature. This story has been updated with comment from GSA.